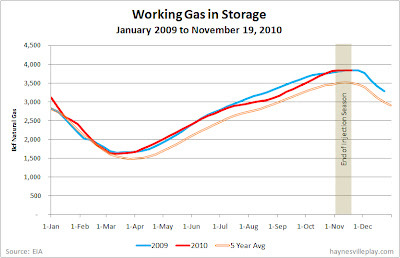 The weekly EIA working gas in storage report showed a 6 Bcf decrease in storage to 2.837 Tcf. The weekly change is somewhere between last year's change (+5 Bcf) and the five year average (-13 Bcf). The current storage level is only 7 Bcf higher than last year's (record high) level and 334 Bcf, or 9.5%, higher than the five year average.